Four vehicles have been destroyed and others damaged in a fire at a repair garage in North Wales. G&H Car&Commercials Ltd on the Caernarfon’s Cibyn industrial estate went up in flames on the morning of 12 November. Fire crews were called to the site and by the time the blaze was extinguished extensive damaged had been done to the premises and the vehicles stored on site. Car garages, because of the items stored on the site, are at risk from fires starting – this is why a high quality combined motor trade insurance policy is so important. This will enable a business to get cover for the vehicles, spare parts, tools, equipment and the building itself. The garage, which carries out repairs, servicing and MOT tests has had to close while the damage is addressed. Three vans and a car were destroyed in the incident, and fire crews confirmed that several other vehicles were damaged. 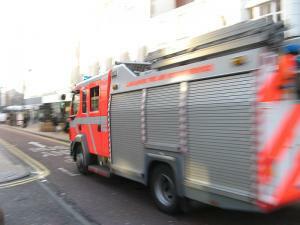 There was extensive fire and smoke damage caused to the building as well, the Welsh Daily Post reported. An eyewitness from a nearby unit said: “As I arrived for work I could hear an alarm sounding but there was no sign of a fire. Then the boss came in and said we’d better keep the windows and doors closed. “I saw smoke coming out from the roof and then there were flames. The smoke was billowing out into the sky.